Keep facility spaces eye-catching, clean and debris free with the Slat Style Trash Receptacle from the Savannah Collection. 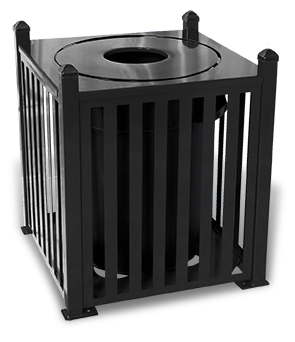 The all-steel construction, decorative square body design combined with a corrosion resistant finish, allows this 32 gallon trash receptacle to withstand harsh seasonal conditions without compromising its original look. The choice of flat top, rain bonnet or ash urn lid each provide a generous 8" round opening with 360 degree access to dispose of trash. These steel tops seamlessly connect to the base and are simple to remove for access the included heavy-duty black plastic liner. Each of the lids encourages the proper of disposal of waste while concealing contents, minimize odors and discourages collection of precipitation and restricts unwanted pests. Create a cohesive collection with a matching 4' or 6' slat style park bench from the Savannah Collection.